Doka UK 16 November 2018.- Construction companies that use the latest technologies will overtake their competitors and become more efficient at servicing their customers. This trend is already a reality. Within the formwork industry, powerful 3D modelling and BIM capabilities available today are changing the way temporary works are being designed and incorporated into main contractors, planners and developers plans. On the digital design of the formwork we discuss Tekla, a 3D Construction Modelling Software that works with all materials and the most complex structures. 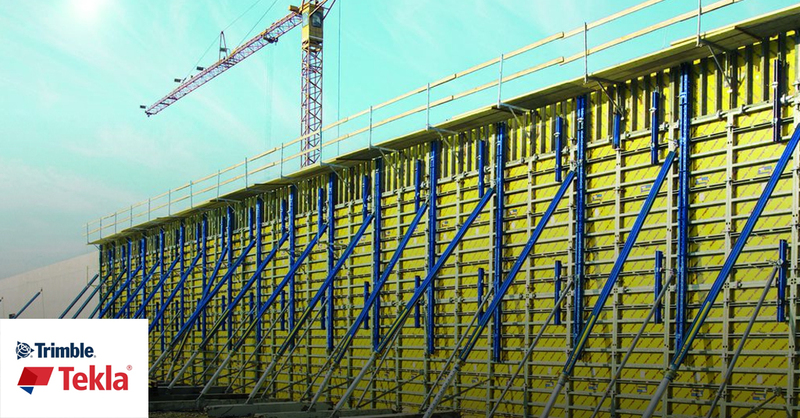 Their conclusions are very clear for construction professionals responsible for formwork solutions. According to a report by Tekla, Digital processes in the construction industry are constantly evolving, with formwork design and management being a recent key area of growth. Sales Consultant at Trimble, Ben Fentem explores how formwork businesses can improve productivity. He states that the ability to model both concrete objects, and the reinforcement within these elements, accurately, now gives the temporary works industry a much-improved starting point for their processes. Combine this with the availability of digital, constructible, formwork and falsework components means that it really is the time for the temporary works industry to seize the opportunities available to them. Traditionally, a lot of the time spent by a temporary works designer was the application of standard components onto non-standard solutions based upon limited 2D information – a set of general arrangement drawings. In this 2D world, changes were also difficult to manage when project information was evolving continually, especially having to react whilst maintaining the desired speed, accuracy and quality needed by the site teams. Whilst these are familiar challenges faced by UK formwork contractors, the good news is that things in the concrete world are evolving and software solutions provide the necessary digital environment to facilitate greater visibility and some eye-opening improvements to productivity for formwork contractors. For Tekla it is evident that helping to speed up productivity in the office, can help eliminate repetitive tasks, for example using automated, dynamic tools, you can simply click and drag formwork panels along the full length of a concrete wall. Similarly, standard table forms can be laid out easily across the scope of a slab pour with only edge conditions requiring additional detailing. Intelligent placement tools can be used to automate primary and secondary centres as well as placing clamps and ties accurately, with the option to still make manual adjustments if required. This is where modelling really comes into its own. Not only can the concrete contractor understand how the reinforcement goes together for the concrete elements but the implications of the formwork solution can be fully coordinated too. Ties, embeds, couplers, lift heights and access arrangements can all be coordinated with the permanent works design. By removing clashes in a digital environment, the level of productivity and accuracy on site is increased, delivering a coordinated formwork plan in a more effective way. This not only achieves right first time results but also ensures a safer, more productive workplace. Finally, Tekla concludes that the combined permanent and temporary works model becomes the single source of truth. Quantities can be taken directly from the model, parts lists can be created easily as well as fully detailed drawings; complete with annotations, dimensions and even 3D visualisations. Outputs can be bespoke but are consistent too, meaning that project teams can receive digital information in the best way for them to allow fast and accurate working. The powerful 3D modelling and BIM capabilities available today really do make the creation of detailed formwork plans faster than ever before. Contractors have full visualisation into how formwork is planned and can more efficiently manage and coordinate their projects. Doka, one of the world’s leading companies for developing, manufacturing and distributing modern formwork systems, have published intelligent 3D components for some of their most popular wall and floor systems in Tekla Warehouse – online content and application ecosystem for Trimble’s Tekla Structures. This development enables Doka’s customers, contractors planning and pouring concrete, to utilise the Tekla Structures Building Information Modeling (BIM) solution to manage formwork information more easily and enable success on-site. As leading solution providers in the concrete industry, Doka and Trimble enable concrete contractors to better manage their project information. Concrete contractors using Tekla Structures can now download constructible 3D components for some of Doka’s most popular wall and floor systems directly into their project models. “For concrete contractors, the ability to download Doka wall and floor system components directly into your project is a significant improvement in efficiency,” says Andy Dickey Business Development Manager at Trimble. “These components enable contractors to quantify and plan their own formwork layouts as well as coordinate the formwork with other work if they wish”. Andreas Aflenzer, Head of Engineering Software Development at Doka says “we want to offer solutions and services to our customers to prepare and communicate all the knowledge needed for a successful project. By having our wall and floor systems easily available for users of software solutions like Tekla Structures, our customers can optimize the use of Doka formwork systems and help them ensure their success on site”. Doka showcase high-rise competencies at Birmingham seminarConstruction companies have to invest in Blockchain technology already?